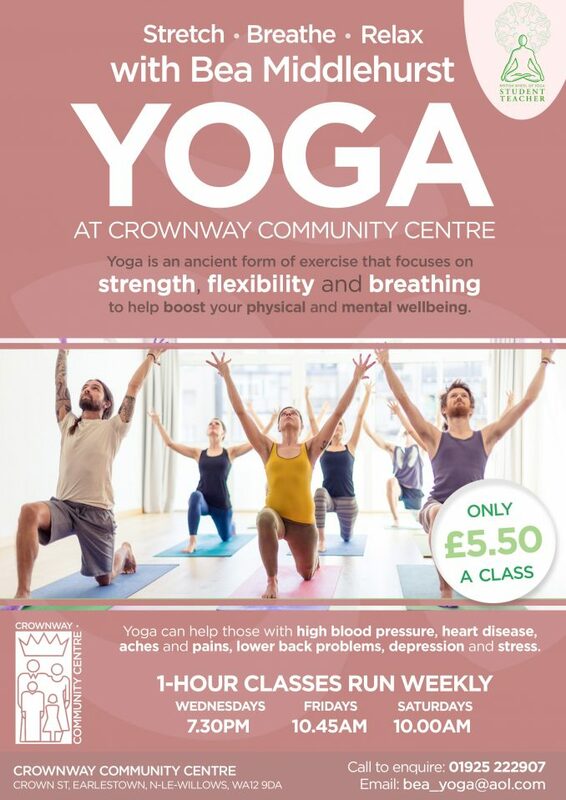 Bea Middlehurst (BWY.DIP) Student Teacher presents three Yoga classes at Crownway Community Centre. If you would like to attend any of these, please book a place by contacting the Centre on 01925 222907 or email us using the Quick Contact feature. PLACES ARE LIMITED, so please book soon. The word Yoga is derived from the Sanskrit word yuj and means union. In Yoga, the body, breath and mind are seen as a union of multi-dimensional aspects of each and every human being. Yoga cultivates health and wellbeing (physical, emotional, mental and spiritual) through the regular practice of a range of many different techniques, including postures and movement, breath awareness and breathing exercises, relaxation and concentration, self-inquiry and meditation. Yoga classes vary, depending on the particular style or tradition of the teacher or school. Students may often practice on yoga/exercise mats. Meditation is usually an integral part of yoga and many yoga teachers may offer classes dedicated to the practice of meditation. Participants usually practise either on cushions on the floor, or seated on chairs.